6162 115PF 24 Pfg. 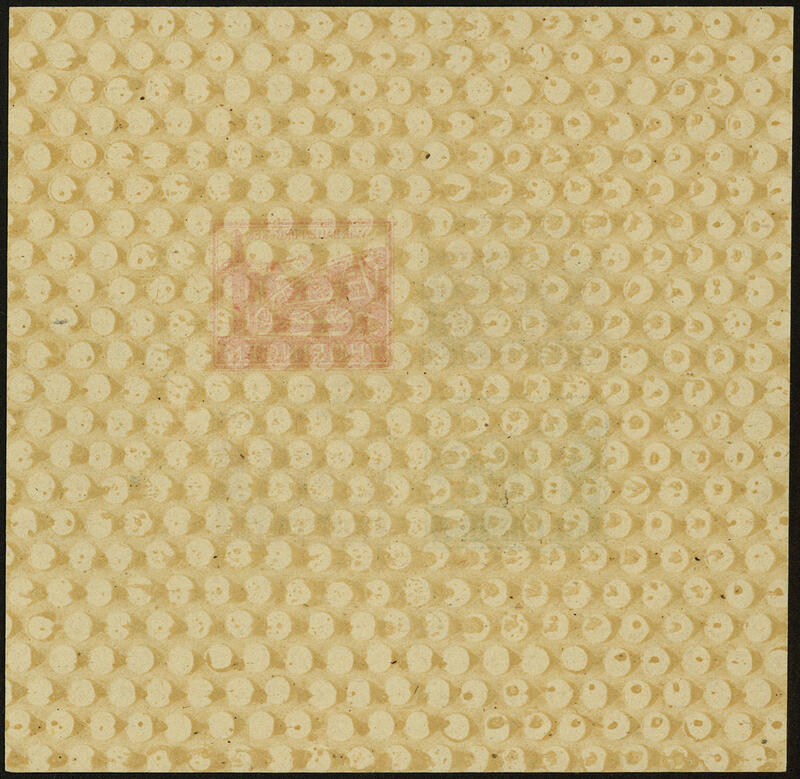 Bridges building 1946, the spectacular proof in the color error dark reddish brown in lieu of orange brown as single print with fully gum coating, unperforated in the size 190, 3 : 149, 2 mm, fresh colors with fully gum coating, except for three tiny hardly visible little yellow spots in perfect condition mint never hinged one of the great SBZ-rarity, the even in the largest special collections is absent! Photo expertize Ströh BPP. 6163 ⊙ AI/III Holzhausen set 1945, all three values fresh colors and very well perforated, uniform centric cancellation \"HOLZHAUSEN 3.8.45. \" from first day. 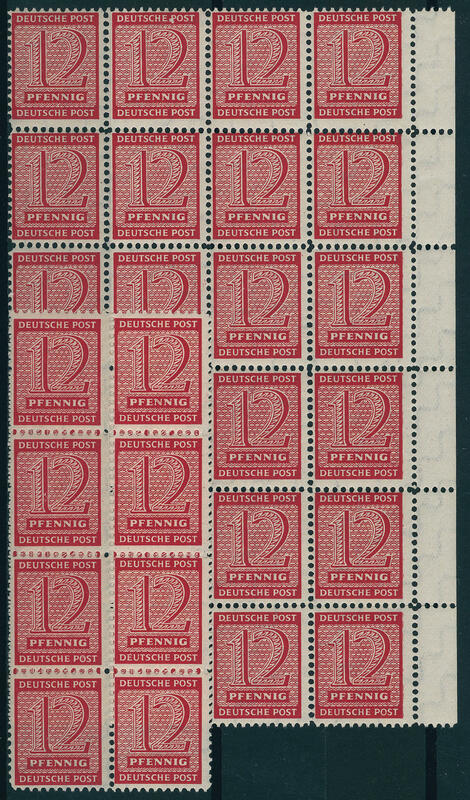 Genuine and on self-formed pages sets of this issue are very rare! Photo expertize \"genuine and immaculate\" Ströh BPP. 6164 ⊙ Bl.4ayI Bridge building souvenir sheet 1946, fresh colors in full original size, very fine centric and neat cancelled \"NORDHAUSEN 20.4.46. \" in outstanding quality. Photo expertize \"genuine and immaculate\" Ströh BPP. 6165 Bl.4ayI/I Bridge building souvenir sheet 1946, with variety \"reverse weak offset the 12 Pfg. 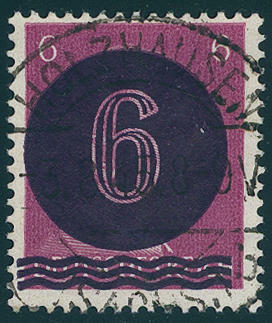 Stamp\", fresh colors and in full original size, in perfect condition mint never hinged a decorative and scarce variety! Photo expertize \"genuine and immaculate\" Ströh BPP. 6166 WZd1dy 10 Pfg. Gutter 12 Pfg. Bridges building 1946, horizontal se-tenant, as well the 12 Pfg. 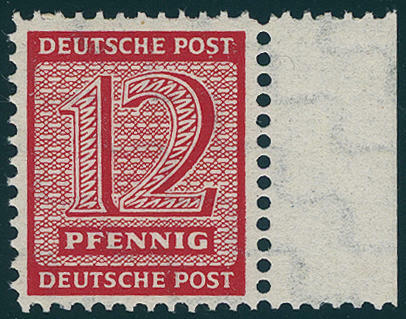 In extremely rare colour brownish red, fresh colors and with wide margins, in the gutter folded, as far as in perfect condition mint never hinged a spectacular Soviet Zone rarity, the also in the Ströh collection not included was. In the Michel special catalogue due to missing offers only noted without price! Photo expertize Ströh BPP. 6167 116/19AY 5-12 Pfg. 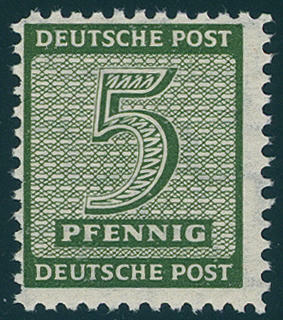 Numerals 1945, all fours values with increasing watermark and postmaster separation from \"MÜGELN\", fresh colors and very well perforated, in perfect condition mint never hinged a hardly ever offered set! Photo expertize \"genuine and immaculate\" Ströh BPP. 6168 ∆ 116/19GX 5-12 Pfg. 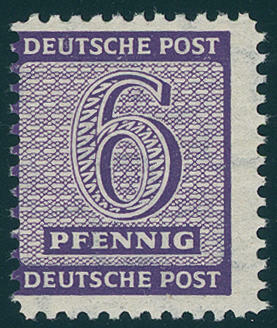 Numeral, falling watermark, the complete set from four values uniform from lower margin on beautiful letter pieces, perfect used \"KRIEBITZSCH 7.11.45. \", a very scarce set in exception-quality, photo expertize \"genuine and immaculate\" Ströh BPP. 6169 ⊙ 116CY 5 Pfg. 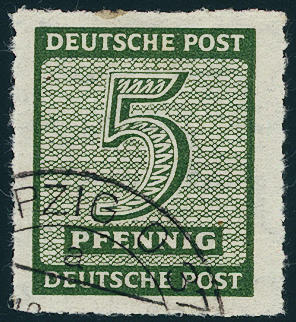 Blackish olive green, increasing watermark, rouletted 10 from post office Horse wine, neat cancelled \"LEIPZIG\", rare stamp, photo expertize \"genuine and immaculate\" Ströh BPP. 6170 ✉ 116DY,116CX 5 Pfg. Blackish olive green, four piece rouletted 16 from post office Horse wine, increasing watermark, as well two pieces 5 Pfg. Blackish olive green and two pieces 12 Pfg. Bright carmine red rouletted 10 from post office Horse wine, as well 12 Pfg. 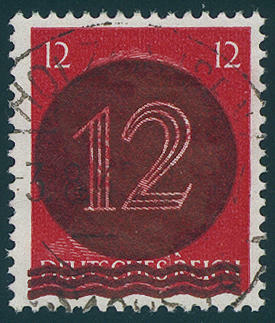 Bright carmine red rouletted 16 from post office Horse wine, with additional franking on attractive registered C. O. D. Cover, correctly franked from \"ETZDORF over Horse wine 16.1.46. 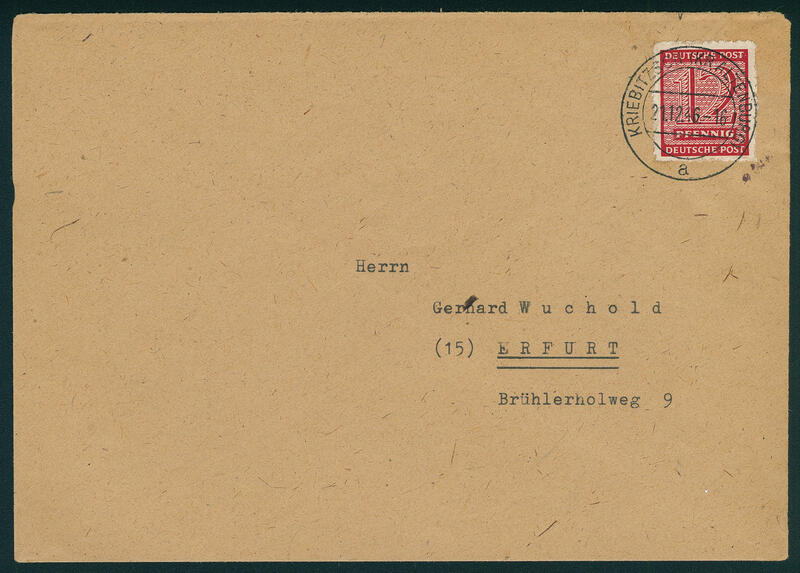 \" to Chemnitz with arrival postmark. A significant franking rarity of the SBZ! (Michel no. 116 DY, 116 CX, 119 CX, 119 DX, 118 X private roulette). Photo expertize \"genuine and immaculate\" Ströh BPP. 6171 ⊙ 117CXb 6 Pfg. 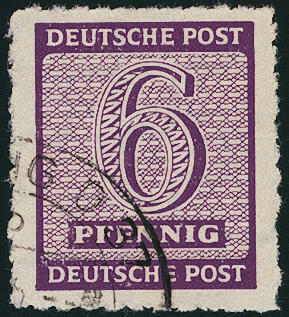 Dark red violet rouletted 10 of the post office Roßwein, falling watermark, fresh colors with faultless roulette, neat cancelled \"LEIPZIG\", an extremely rare stamp, the due to missing offers also in the Michel special catalogue only noted without price is. Photo expertize \"genuine and immaculate\" Dr. Jasch BPP. 6172 ✉ 117GXa 6 Pfg. 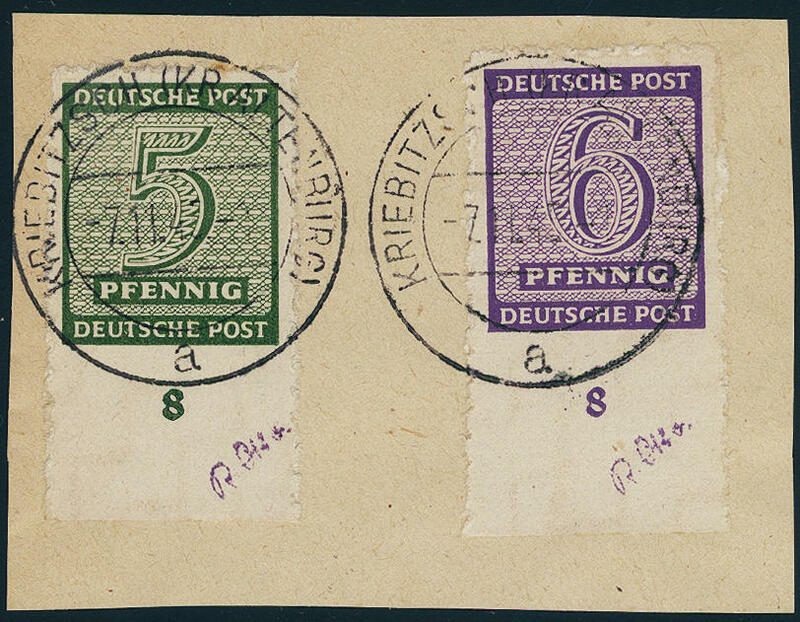 Gray violet with scarce sewing machine roulette from Kriebitzsch from left margin of sheet, fresh colors and in perfect condition as very nice and extremely scarce correctly franked single franking on commercially related postcard with two ring cancel \"KRIEBITZSCH 11.2.46. \" to Munich. There are very few commercially related single frankings have become known, the to the rarities the postmaster separations count. Photo expertize \"extremely rare, perfect quality\" shrub BPP. 6173 118AYUMw 8 Pfg. 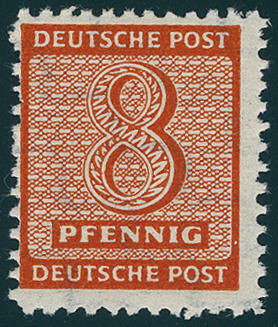 Red orange, rare increasing watermark, vertical pair in the middle unperforated with lines perforation 11 ½ from post office Mügeln, from lower margin, in perfect condition mint never hinged a spectacular rarity the postmaster separations and due to missing offers also in the Michel special catalogue only noted without price! Photo expertize \"genuine and immaculate\" Ströh BPP. 6174 ✉ 118DX 8 Pfg. 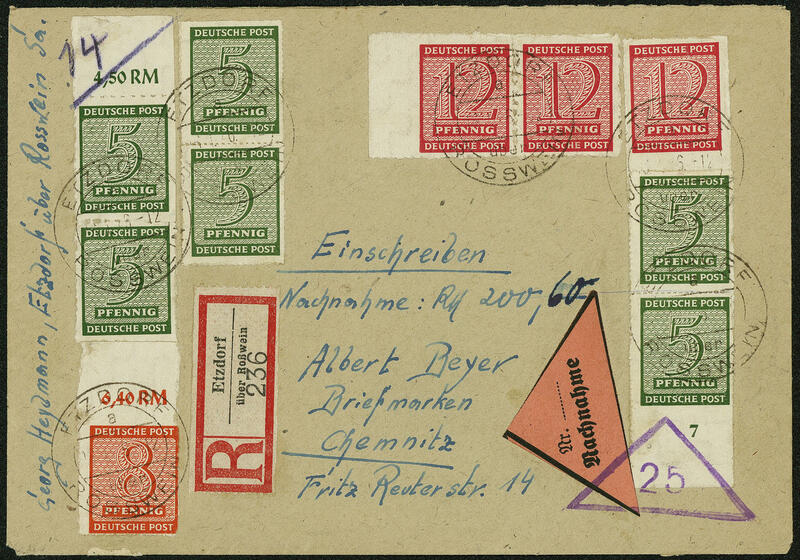 Bright red orange, falling watermark, postmaster roulette from Horse wine, extraordinarily decorative and scarce mass multiple franking from 14 pieces on not correctly franked registered cover from \"ETZDORF 15.3.46. 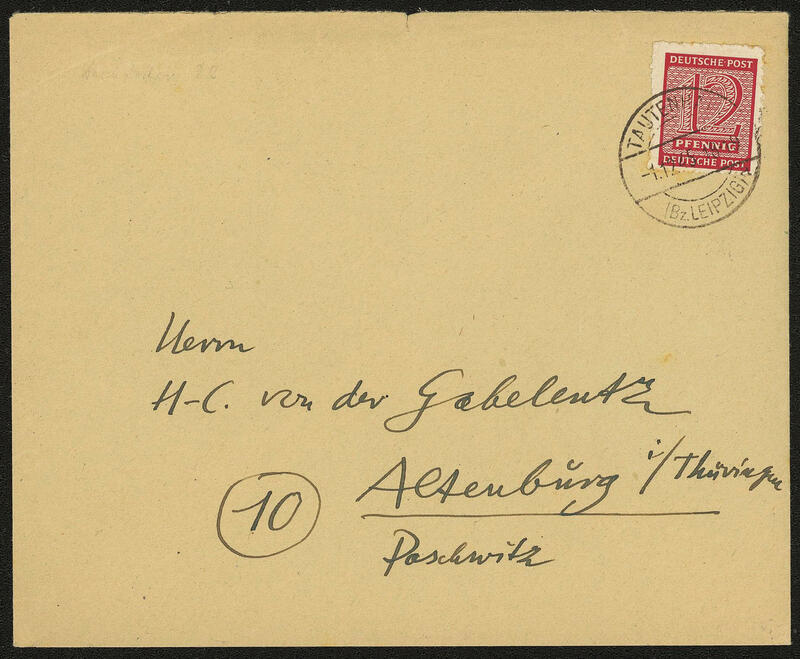 \" to Hamburg with arrival postmark. Very decorative and rare, in this kind a Honor for the sophisticated special collection! Photo expertize \"genuine and immaculate\" Schulz BPP. 6175 119AX 12 Pfg. 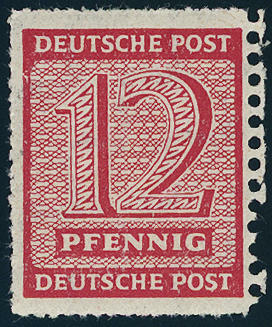 Bright carmine red, falling watermark, postmaster separation Mügeln, 32 pieces in two multiples, in perfect condition mint never hinged, expertized Ströh BPP. Michel 2080,- €. 6176 119B/DX 12 Pfg. 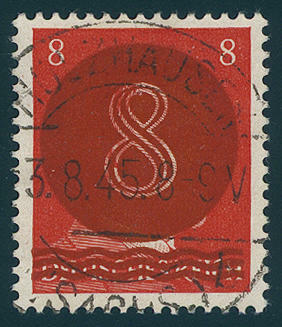 Bright carmine red, three sided rouletted 16 and right with perforation 11 ½ from post office Horse wine, fresh colors and in perfect condition mint never hinged a very rare stamp! Photo expertize \"genuine and immaculate\" Ströh BPP. 6177 ⊙ 119C/DX 12 Pfg. 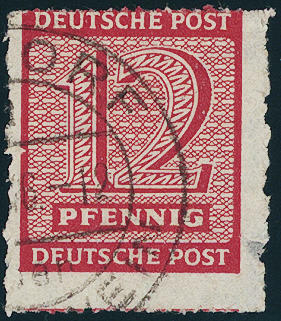 Bright carmine red, falling watermark, rouletted 10 and additional roulette 16 from post office Horse wine, neat cancelled \"ETZDORF\", right small thin spot in the margin, otherwise in perfect condition. A large Soviet Zone rarity, of the only a few copies became known are. In the Michel special catalogue only noted without price! Photo expertize Ströh BPP. 6178 ✉ 119FX 12 Pfg. 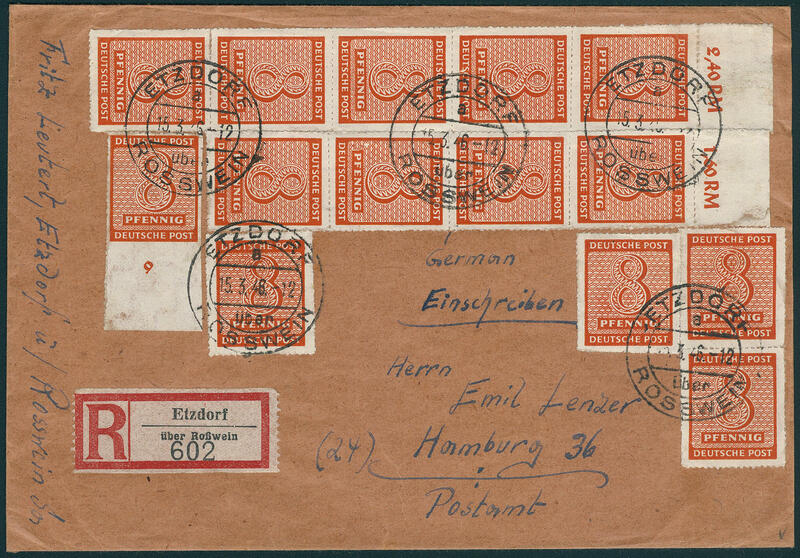 Bright carmine red rouletted from post office Holzhausen, falling watermark, horizontal pair from upper margin with additional franking on very nice, correctly franked registered cover from \"LEIPZIG 23.4.46. 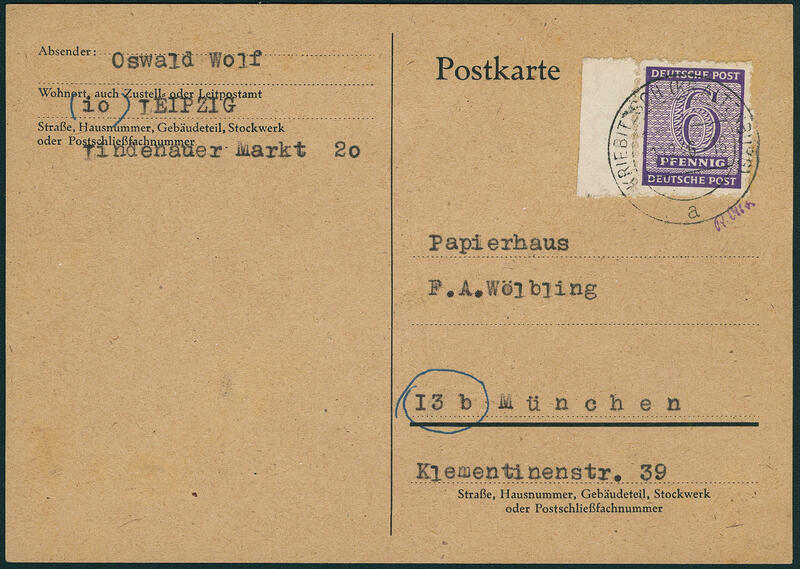 \" to Constance with arrival postmark. Covers of this kind to class among the large SBZ-rarities, photo expertize \"genuine and immaculate\" Ströh BPP. 6179 ✉ 119FX 12 Pfg. 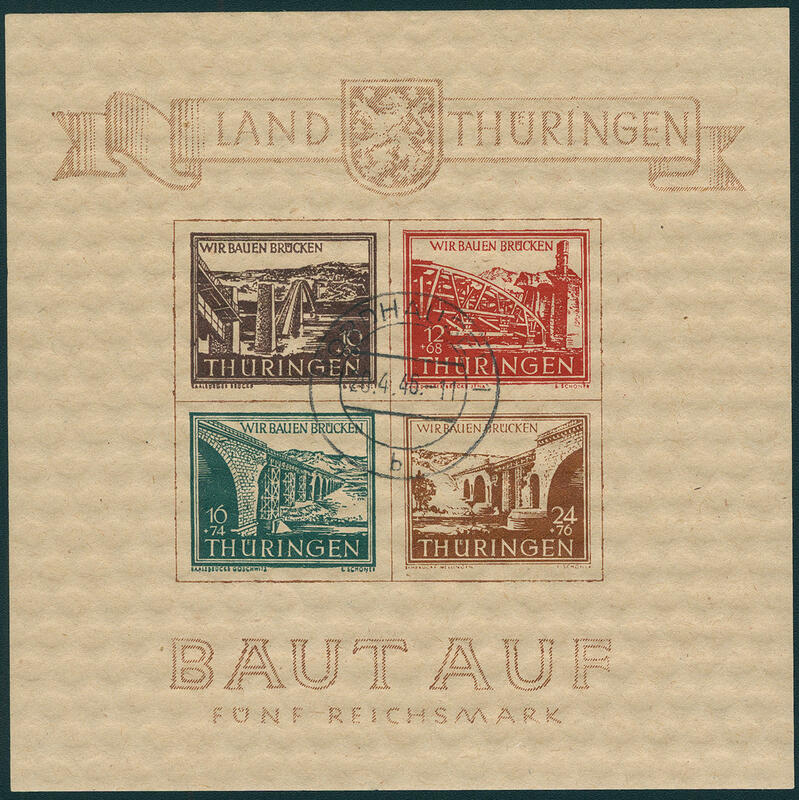 Bright carmine red, the very scarce postmaster separation from Holzhausen, falling watermark, fresh colors and in perfect condition as correctly franked single franking on commercially used cover with clear two ring cancel \"TAUTENHAIN (BZ. LEIPZIG) 1.12.45. 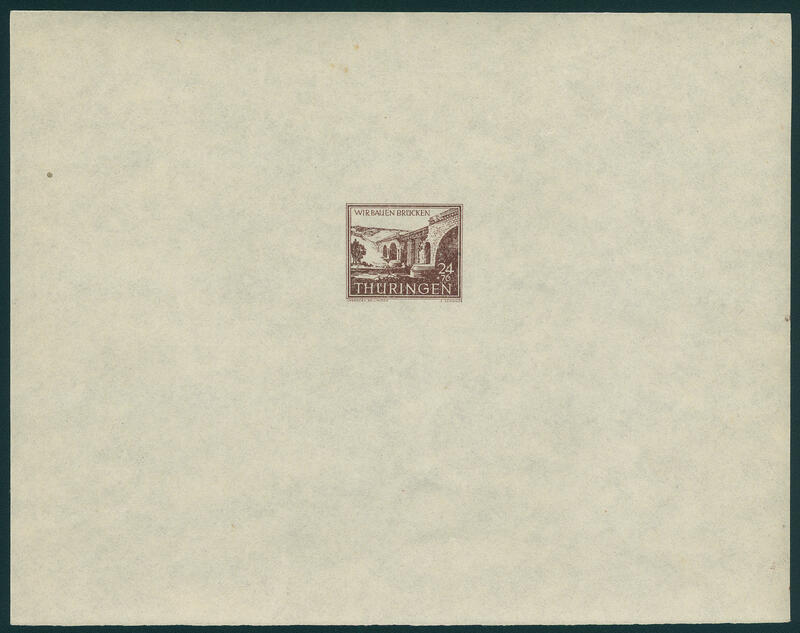 \" to Altenburg / Thuringia. There are very few commercially used letters of this issue have become known. 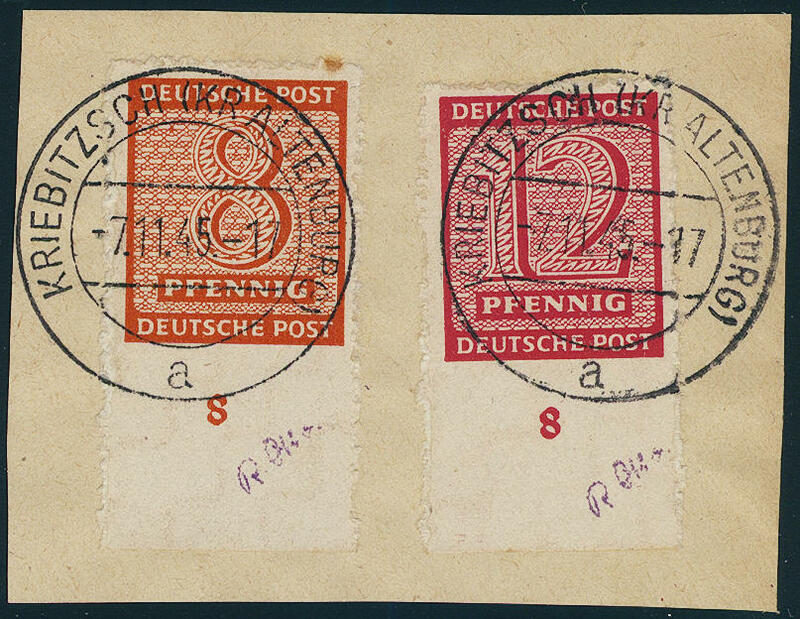 These correctly franked single franking counts to the all large rarities of the SBZ. Cover minimal, insignificant traces of usage. Photo expertize \"genuine and immaculate\" Ströh BPP. 6180 ✉ 119GX 12 Pfg. 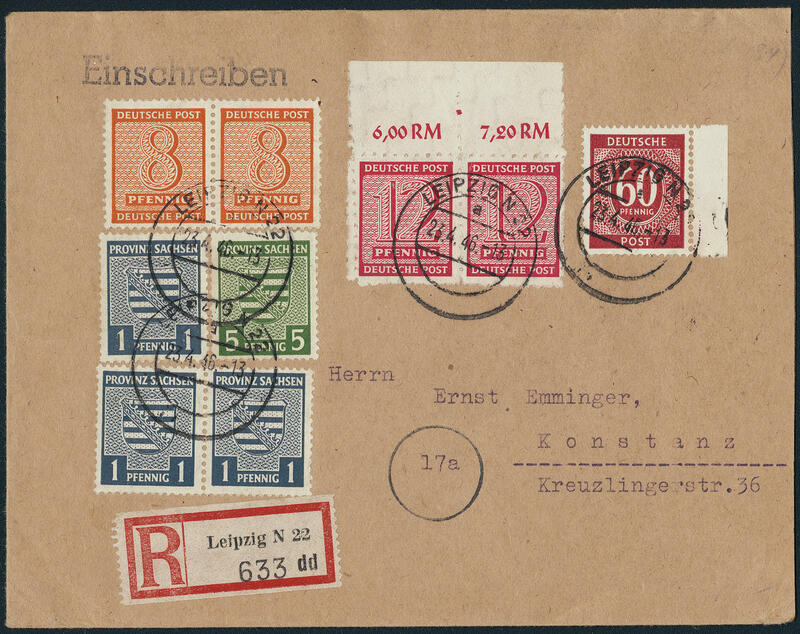 Bright carmine red, postmaster roulette from Kriebitzsch, fresh colors and in perfect condition as correctly franked single franking on very scarce commercially used cover from \"KRIEBITZSCH 21.12.46. \" known stamp error in of the year to Erford. There are only few commercially used letters from this known. A Soviet Zone rarity! Photo expertize \"genuine and immaculate\" Ströh BPP. 6181 WZd12Uo 12 Pfg. Numeral, horizontal strip of four with gutter, all fours stamps above unperforated, falling watermark, in perfect condition mint never hinged a spectacular se-tenant rarity, by Michel fully undervalued. Photo expertize \"genuine and immaculate\" Ströh BPP.